Stage d’été à Oxford avec James Whitbourn. Jame Whitbourn nous envoie des informations concernant un stage d’ete en Angleterre, a l’University of Oxford. Son mail (en anglais) est dessous. Et pour plus d’info voici la page web du stage. I’d be hugely grateful if you could pass this to students and friends, especially young singers and composers, who might be interested in applying for the singers’ or composers’ course – or feel free to post on your groups and to your contacts. It’s an Oxford University residential programme, offered by the Oxford University Department of Continuing Education. 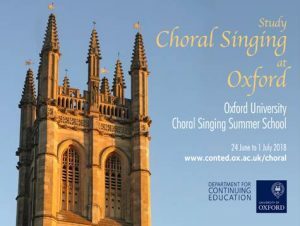 Students all reside in college and sing and study English choral repertoire within the beautiful acoustics at Oxford. Last year’s course was a resounding success, with wonderful making-music and great friendships made. Students work hard but there is time also to enjoy the wider range of beauties that Oxford has to offer. Now is the time for applications!